Successfully Added Bluetooth Rearview Mirror with Embedded Mini-LCD to your Shopping Cart. 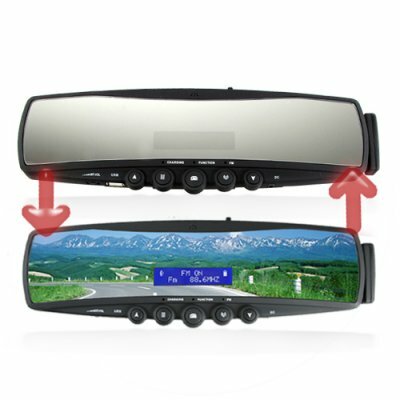 Handsfree Bluetooth rearview mirror car kit. This Bluetooth rearview mirror is smart and safe, allowing you to keep your eyes on traffic while making and receiving calls. Simply snap it over your existing rear view mirror and you are ready to hit the road! Making calls with this unit couldn't be simpler, a few button presses is all it takes to setup the unit, then you can start using the button controls or handsfree functions for phoning while on the road. The Bluetooth LCD view screen is embedded inside the mirror and only lights up when there is action, so there is no blind-spot when you are checking out what's behind you on the super wide racing style mirror panel. This unit will also play music via the built-in speaker or send music from a SD card or USB flash drive over FM signal to your car stereo, so you can take your favorite music with you wherever you choose to go. Available right now at a low wholesale price with no M.O.Q. and fast worldwide delivery time. From the leader in wholesale direct from China Electronics, Chinavasion. Backlit LCD display shows call information when making or receiving call.